Our "complete the picture" printables are an original way of encouraging kids to use their imagination as well as their design and drawing skills, and can be used with all ages with great success. This budgie needs eyes and of course a little beak! Can you draw them on for him? Help develop drawing confidence by getting the kids to add n the details to complete the caterpillar picture. Don't forget to colour it when you've finished! Here's a fun printable sheet in which children are asked to complete the picture of a funny cartoon chicken before colouring it in! Kids can print out and complete the picture of this cute little duck before colouring it - fun for little ones! Print this Complete the Picture Elephant and see if your kids can follow the instructions to finish the elephant picture - good practice and good fun! This guinea pig is missing a cute face! Can the kids draw one for him, using the smaller picture as a guide? Kids can print out and complete the picture of this cute little hamster before colouring it - fun for little ones! This is a fun activity for observation and copying skills! Look at the finished version of the monkey and then add in all the missing details on the black and white version! These pages are such a fun way to get your kids started on an imaginative drawing / colouring session, especially if they lack confidence or need a bit of a push. We've provided the beginnings of 6 monsters. All they have to do is fill in the rest! Ask your child to complete this beach picture, using the beach towel, bag and umbrella as a starting point. What else will there be in the scene? Your child can have fun completing this seaside picture, prompted by their imagination and the bucket and space they can already see. One of a set of Wheel themed "complete the picture" doodle pages for kids, this one features car wheels. What kind of car will your children draw? Monster truck wheels are crazy, and your children will be able to use this Complete The Picture printable to create their own crazy Monster Truck drawing! Who will be driving the truck? All that you will see on this Complete the Picture printable sheet for kids is a traditional red wagon, and plenty of space for your child to fill in the details of the scene! Who is pulling the wagon? What are they pulling? What kind of truck or lorry will your child draw on this Complete The Picture doodle worksheet? Use the truck wheels to get you started. Maybe this isn't a truck at all, but a robot or an interesting machine? 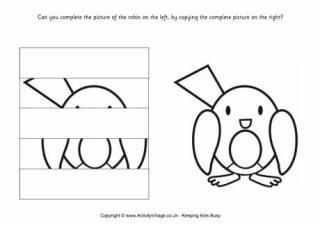 Print out this fun complete the pig picture worksheet for little kids - just one of a set which encourages children to look, copy and colour. Did you know that the hanging skin under a rooster's beak is called a wattle? Neither did I! Can you complete this rooster picture by drawing on the wattle? Don't forget the eyes, beak and feet too! Children need to spot the differences and correct them on this fun printable sheet for younger kids. Good practice for learning to draw sheep too. Kids can have fun with this tiger printable. Add face, stripes and a tail to make the picture complete, then colour it in! Can the children draw a face on this tortoise, and decorate his shell too? Whether you are looking for farmyard activities or something for Thanksgiving, this turkey printable activity for younger kids may do the trick! Kids need to fill in the missing details on the turkey before colouring it in.